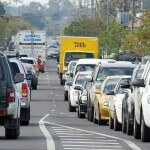 As part of the 2013-14 State Budget Update, the Victorian Government announced that the congestion levy boundary would be expanded in the biggest and most sweeping changes since the congestion levy’s introduction in 2006. 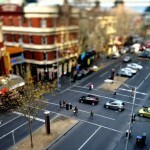 The Victorian State Revenue Office’s controversial Congestion Levy (Parking Tax) will expand with a Category 2 area to come into effect from 1st January 2015. The new area is not only larger than the initial “CBD” area, but includes areas that are simply non-commercially viable and will in turn effect paid parking areas, potentially converting them into free parking areas to simply avoid paying the levy. This certainly won’t kerb congestion, pollution or raise the expected revenue the government seeks from this new action. The new Category 2 area will be levied at a “concessional” of $950 per space, while the levy on the current Category 1 spaces has already increased from $960 to $1,300 per space on 1st January 2014. These changes have a huge impact on the economic viability of not only the car parks imposed with the levy in these areas, but on commercial and retail business, as the cost of doing business will rise an estimated $1,300 per staff member P.A. and parking rates will need to be increased to support the new tax. For the Category 1 area, the levy for each non-exempt parking space will increase from $1340 in 2015 to $1360 for 2016. For the Category 2 area, the levy for each non-exempt parking space will increase from $950 in 2015 to $960 for 2016. Adjusted levy amounts are released in November each year, indexed annually for CPI. Interestingly the congestion levy is meant to be index annually at the CPI rate and whilst the Category 1 area, increases from $1360 in 2016 to $1380 for 2017, the Category 2 area increased at a higher rate than the indexed CPI, from $960 in 2016 to $980 for 2017 and arguably should actually be around $970 to $975 per space. The massive expansion of the levy in 2015 to include a Category 2 area was extreme and are a disproportionate fee for the areas. As can be seen from the graph below (provided by Parking & Traffic Consultants) that whilst Melbourne’s Category 1 area is below that of Sydney, Melbourne’s Category 2 area is far higher than Sydney’s $780 current levy (after 15 years). 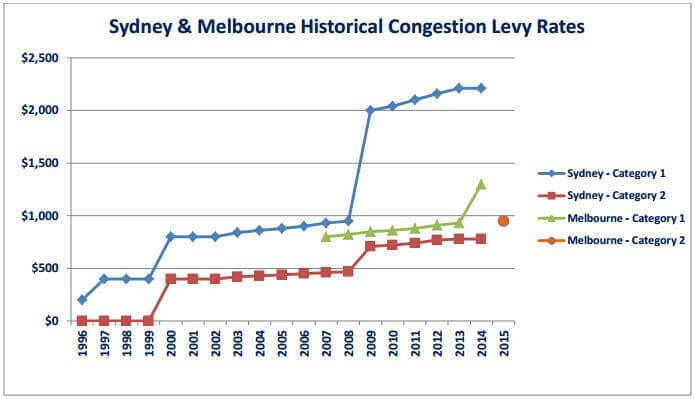 Is the Congestion Levy really aimed to reduce traffic congestion in the Melbourne CBD and surrounding suburbs, reduce pollution and encourage greater public transport usage? Currently, money collected by the Congestion Levy (parking tax) is placed into consolidated revenue for the State Government and is meant to be reinvested back into public transport infrastructure. However, there is no link between the revenue and investment in schemes to reduce traffic congestion through investment in walking, cycling and public transport or even sustainable transportation initiatives. So, if on-street parking can cause such congestion, why would these parking spaces not fall under the levy? Category 1 levy area remains unchanged and is highlighted by the dark blue lines on the map, being bounded by Hoddle St, Punt Rd, Queens Rd, Kings Way, the West Gate Freeway, City Link, Footscray Rd, Dudley St, Peel St, Queensberry St, Rathdowne St, Carlton St, Nicholson St, Gertrude St and Langridge St.
Category 2 levy area is the new and highly contentious area bounded by the light blue lines on the map. These areas are divided into two, north and south of the existing category 1 area. North – Carlton, Fitzroy, Collingwood, Parkville, Carlton North, Fitzroy North, Princess Hill, North Melbourne and Residential West Melbourne. 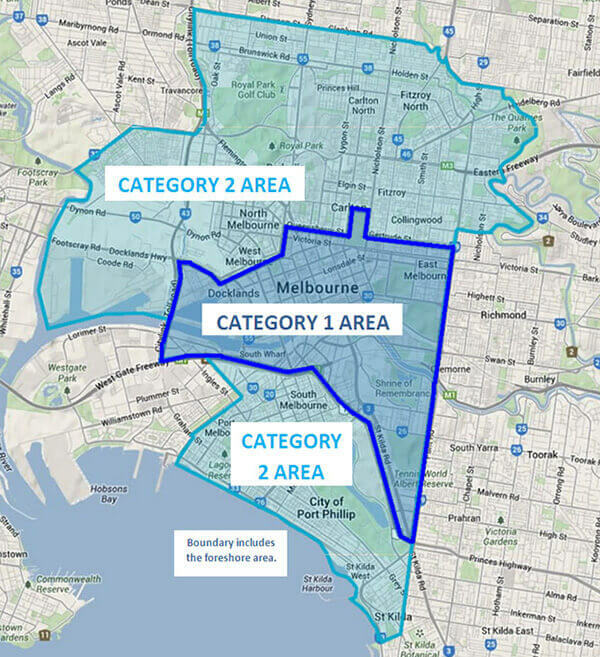 The south category 2 levy area extends all the way to the St Kilda foreshore and Port Phillip Bay, bounded on the east by Hoddle St/Punt Rd/Nepean Hwy, Barkly St and to the west Princes St, Station St, Boundary St to the West Gate Freeway/Citylink. The north category 2 levy area extends right into Brunswick East at Dawson St/Glenlyon Rd. It is bounded to the east by Merri Creek, Yarra River, Gipps St and Hoddle St and on the west by Citylink, then out into Flemington along Racecourse Rd to follow the Maribyrnong River and then the Yarra River back to area 1. Parking for maintenance services and loading bays. The State Revenue Office’s Customer Education Unit conducted free online webinars on 21st October and 6th- 20th November (Monday, Tuesday and Thursday’s) 2014 to explain the recent legislative changes to the congestion levy and the impact it will have to car park owners. The webinar sessions have now finished. Where is the new levy area? How much is the levy and how is it charged? Attendees were able interact with the presenters by typing questions and comments, which the presenters answered during the webinar and a link to the notes supplied to all registrants via email in the lead up to the webinar. You can view a sample copy of the SRO Congestion Levy letter here. What if you haven’t had any correspondence from the SRO? 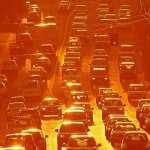 State Revenue Office – New Congestion Levy Area dedicated site page. A full and detailed boundary list can be found on the State Revenue Office Victoria website, this link also provides an interactive map. The baths’ management has warned the levy could result in more congestion and driving if businesses decide to make their paid parking spaces free. Until last week, state schools in many inner suburbs were subject to the levy. But the Victorian government ordered the Education Department to foot the bill instead. 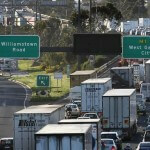 The RACV general manager of public policy, Brian Negus said the levy was ineffective. “This is just a further tax on top of the motoring taxes that everyone pays,” he said. 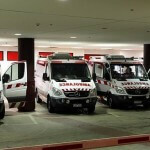 This article discusses how the city’s 12 key medical ­facilities collected $70 million from charging patients and their often traumatised families to park in 2013-14, lifting the state’s unofficial annual hospital co-payment by $7.2 million, with hospital car park revenues rising 55% in 4 years. Whilst not all of these car parks are in the levy area, for those that are, we pose the question – So why are hospitals exempt from the Congestion Levy, when they are creating congestion and clearly running a profitable car park facility? Our only concern would be patients paying more. 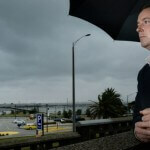 The Municipal Association of Victoria asks the State Government to give back 15% of the money raised from the levy, which was introduced for the City of Melbourne in 2005. Yarra, Moreland, Port Phillip, Darebin and some parts of Moonee Valley are to be incorporated in the levy area from next year. Council have “grave concerns” about the impacts the extended congestion levy could have on community life, says Yarra Mayor Jackie Fristacky. An alternate to the existing congestion levy is proposed in this article through an additional fee to toll road charges. 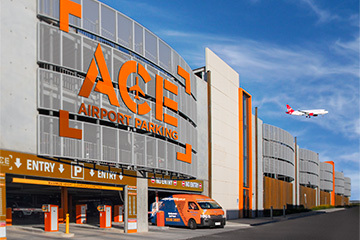 The effects on commercial parking prices and what it means to motorists. Discussing how much we have paid since the inception of the levy and how the system is not transparent it is open to rorting by governments that may be spending the money on other inappropriate initiatives.